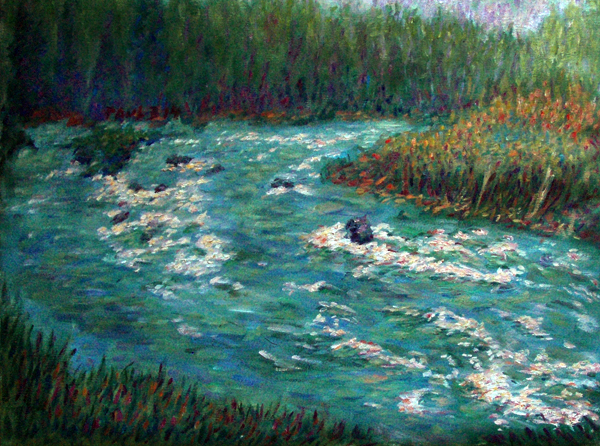 I've done a number of paintings of the Klamath River, all in summer, surrounded by full vegetation, and ready to jump in for a swim. One of the things I love about living in Mt. Shasta, California is that I get to see my favorite summer haunts at other times of year. In early April I took a drive to the Klamath River on a stormy day. The River was full, rushing, and the last thing you would want was to jump in. Instead of bright and sunny, this one is cold and gray. I love the subtilty of the colors in this painting. Notice the soft contrasts of the blues, violets, and reds in the shading of the soft, green trees in the upper part. Contrast this with the golden greens, oranges, reds, and ochre tones of the middle greens forming the "V" in the River, and the blues and muted golden tones in the foreground as the greenish blue water rushes through. PaulB's Pointillistic/Impressionist original oil paintings of California Waterscapes and various prints and poster formats of a wide variety of subject matter by the Pointillistic/Impressionist oil painter from landscape/waterscape paintings, dance, sports, portrait, to classical figures, flowers, rock and roll, Brazil, and California Waterscapes paintings and prints are available for purchase for as little as $24.95 for an 8" x 10" matted print on photo pape. Pointillistic/Impressionist Giclee prints of California Waterscapes on real canvas or heavy watercolor paper are available. One of a kind California Waterscapes embellished prints, which are Giclee prints retouched in genuine oil paint by PaulB. Unless noted PaulB's original Pointillistic/Impressionist oil paintiings are oil on canvas. Paul Berenson's pointillistic/Impressionist oil paintings are in privale collections around the world, including the downtown Los Angeles Athletic Club and have appeared in numerous publications, including the New York Philharmonic Playbill. PaulB.com also builds websites and PaulB is a member of the LA Web Professionals Group.